This recipe is perfect for Spring and Summer as all of the farmer’s markets are opening up and full of fresh zucchini, squash, and tomatoes. With this dish, the fresher the ingredients, the better the flavor will be. I posted an impromptu pic of this dish on Instagram (it was just too pretty not to!) and after many requests decided to share the recipe here. A good friend who knows me all too well gave me the Cook’s Country One-Pan Wonders cookbook for Christmas this year. I am always in search of quick weeknight dinner options that use fresh ingredients. A few weeks ago, I was feeling a little adventurous one night and decided to try something new. After skimming through the cookbook again, I found this vegetable and orzo tian that I had all of the ingredients for at home. Any recipe that doesn’t require a trip to the grocery store during the witching hour with two kids gets automatic bonus points. I knew that I loved all of the ingredients in this recipe, but we were a little surprised at how much we enjoyed this dish. The kids opted for chicken nuggets and mac and cheese as usual, but we loved stepping up our dinner game for the night with the Mediterranean flavors in this dish. 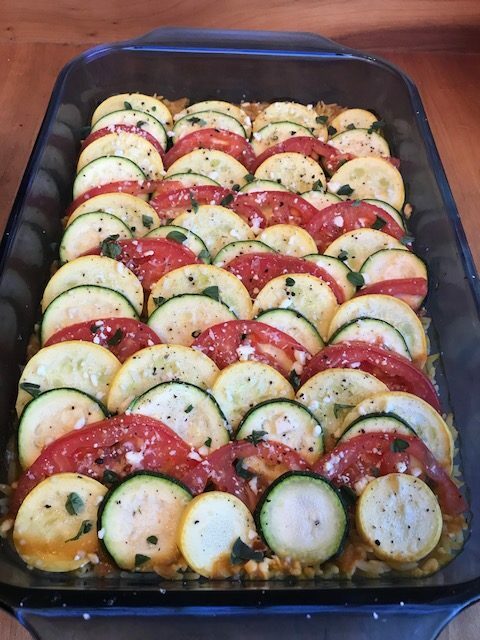 Give the Vegetable & Orzo Tian a try this season and leave a comment below to let us know what you think or if you have any fun variations to try! Preheat oven to 425 degrees and place oven rack in middle position. Spray 9 x 13 oven-safe baking dish with non-stick cooking spray. Combine 1/2 cup Parmesan, orzo, oregano, garlic, pepper flakes, and 1/4 tsp salt in a bowl. Spread mixture evenly on bottom of baking dish. Alternate placing zucchini, yellow squash, and tomato in rows on top of the bed of orzo. Pour broth evenly over the top of vegetables. Bake about 20 minutes until orzo is al dente and most of the broth is absorbed. Remove dish from oven, increase oven temperature or prepare to broil. Drizzle veggies with oil, remaining cheese, salt, and pepper. Cook for about 5 more minutes until slightly browned on top and bubbling around the edges.